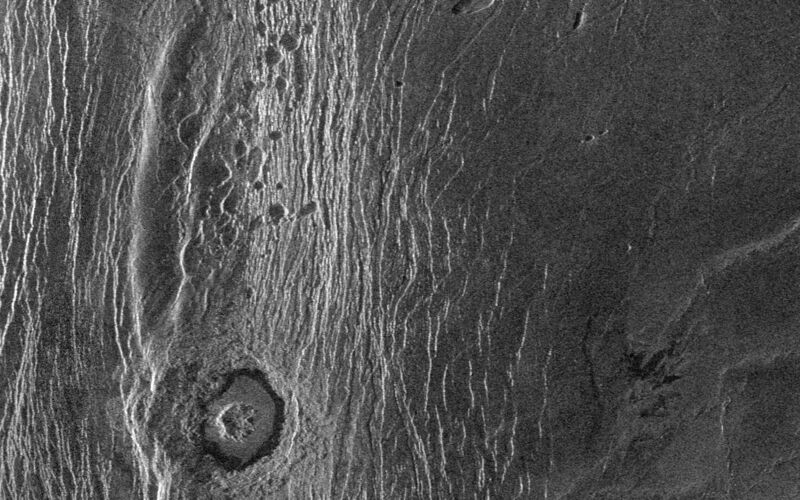 This Magellan full-resolution images show the northern part of the Akna Montes (mountains) of Venus. 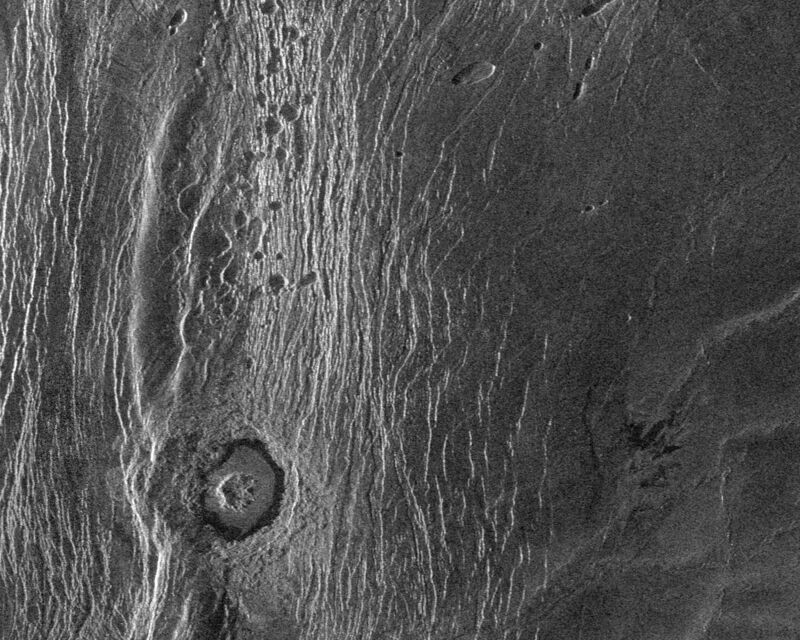 The Akna range is a north-south trending ridge belt that forms the western border of the elevated smooth plateau of Lakshmi Planum (plains). The Lakshmi plateau plains are formed by extensive volcanic eruptions and are bounded by mountain chains on all sides. The plains appear to be deformed near the mountains. This suggests that some of the mountain building activity occurred after the plains formed. An impact crater (Official International Astronomical Union name 'Wanda,' mapped first by the Soviet Venera 15/16 mission in 1984 at low resolution) with a diameter of 22 kilometers (14 miles) was formed by the impact of an asteroid in the Akna mountains. 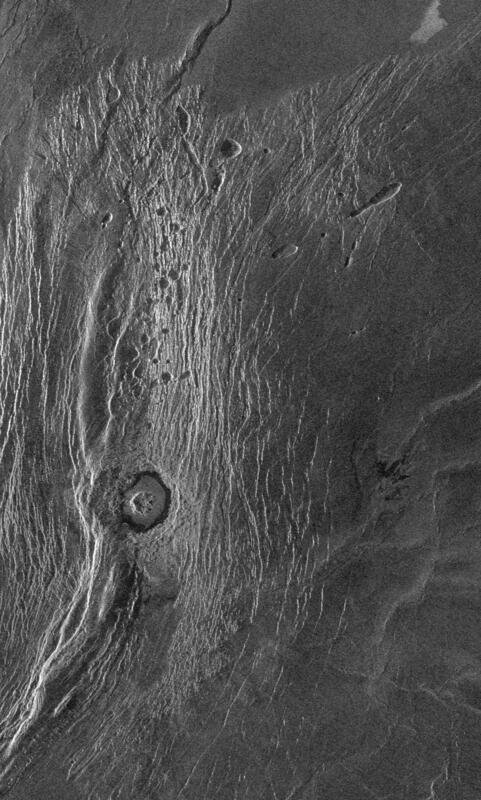 The crater has a rugged central peak and a smooth radar-dark floor, probably volcanic material. The crater does not appear to be much deformed by later crustal movement that uplifted the mountains and crumpled the plains. Material from the adjacent mountain ridge to the west, however, appears to have collapsed into the crater. 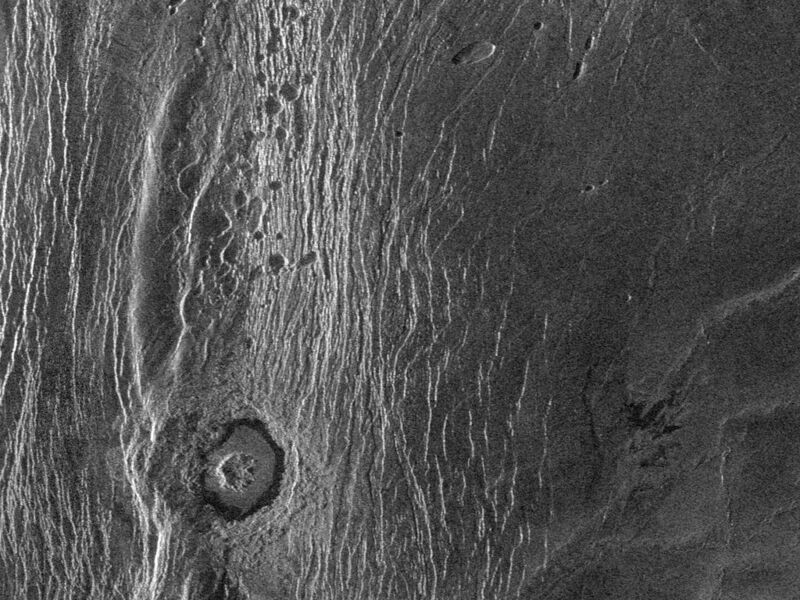 Small pits seen to the north of the crater may be volcanic collapse pits a few kilometers across (1-2 miles). The ridge of the Akna mountains immediately to the west of the crater is 8 kilometers wide (5 miles). The area imaged is approximately 200 kilometers long and 125 kilometers wide (130 by 80 miles). This area is centered at 71.5 degrees north latitude, 324 degrees east longitude. The resolution of the Magellan radar system is 120 meters (400 feet). At this latitude the radar views the surface from an angle of 23 degrees off vertical, creating a perspective as though a viewer were looking at the scene from the right (east) at an angle of 23 degrees above the surface.